Extra Heavy Duty Cable Ties (also called wire ties, zip ties or tie wraps) are effective in applications requiring up to 175 lb tensile strengths. The one piece construction allows for consistent performance and reliability. For heavier duty cable and wire bundling applications, a 175 lb tie is recommended and is available in lengths from 18”-60”. Natural ties are preferred for indoor use applications while UV Black is recommended for outdoor applications, providing greater resistance to ultraviolet light. 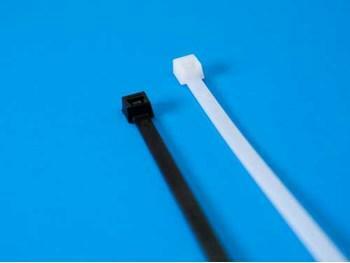 Cable Tie Express stocks the 175 lb cable ties in standard packages of 100 or 50 depending upon the weight and length of the tie. Tensile Strength – 175 lbs.